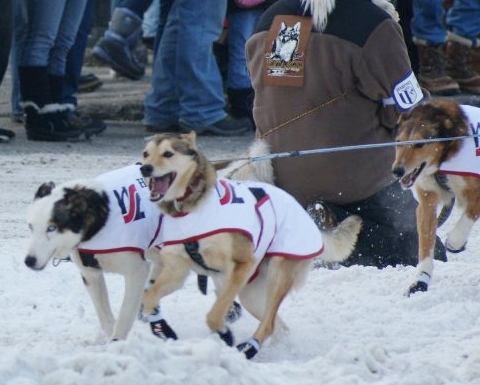 Two weeks after it started, all but one of the mushers from the Iditarod have arrived in Nome. (Well, actually, 12 of the original had to “scratch” (which means, basically, they had to quit before they finished, for whatever reason – generally, it’s either because of the health of their team or their own personal health.) BUT, of the remaining 64, all but one have finished. As I previously mentioned, Mitch Seavey was first to arrive (9 days, 7 hours, 39 minutes, 56 seconds), followed quickly by Aliy Zirkle (9 days, 8 hours, 3 minutes, 35 seconds. The last person to arrive gets “The Red Lantern” award, and this is a very prestigious award! 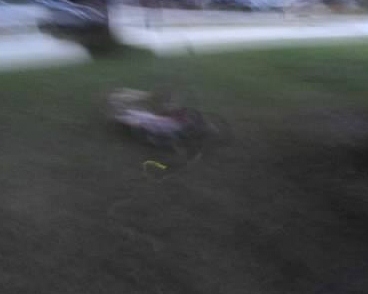 Apparently, it “started as a joke and has become a symbol of stick-to-itiveness in the mushing world.” Perserverance. Determination. I think that has to be true – how hard would it be to know you were last and maybe still days from finishing – everyone else is done, has had a nice bath and a nice meal. Very admirable to not give up!! This year’s Red Lantern, is a first time Iditarod musher, Christine Roalofs, from Anchorage. She JUST finished! 13 days, 22 hours, 36 minutes, 8 seconds. WHAT a relief!! Good for her! Woot Woot!! I didn’t actually see that movie, but did decide to go Winterset because of the movie – you know, Big Ball of String, roadside attraction theme. Celebrity Bridges. We had to get there before twilight, so we could see them, take pictures and still get back to Winterset, where, not only did Francesca watch Robert drive away, but also is where John Wayne was born. We made it to Winterset in record time (especially when you consider how slowly we were moving before, in the disposable car.) and found our way to The Bridges. 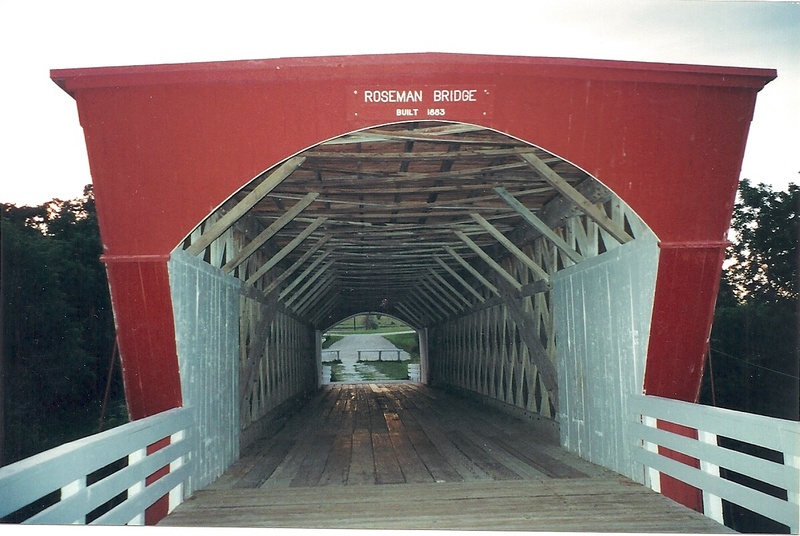 The Roseman Bridge was original built in 1883, and then renovated in 1992. It’s 107 feet and still sits on its original site. 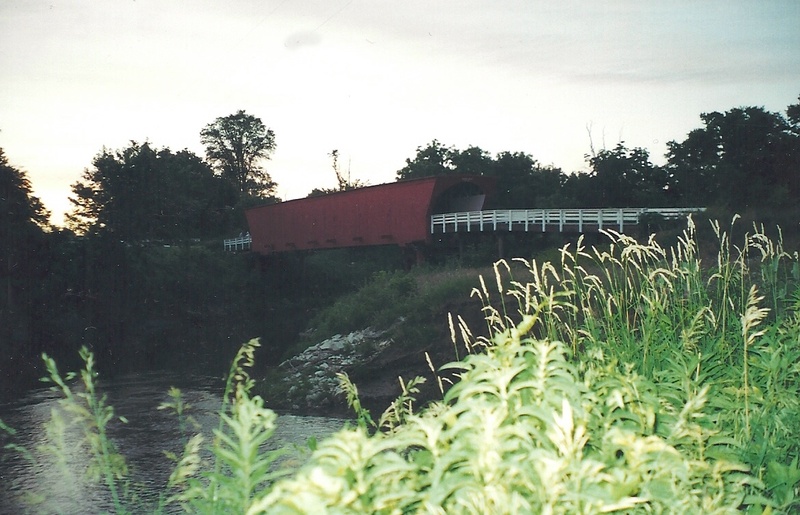 It’s the second longest bridge – the longest is the Hallowell, at 122 feet. 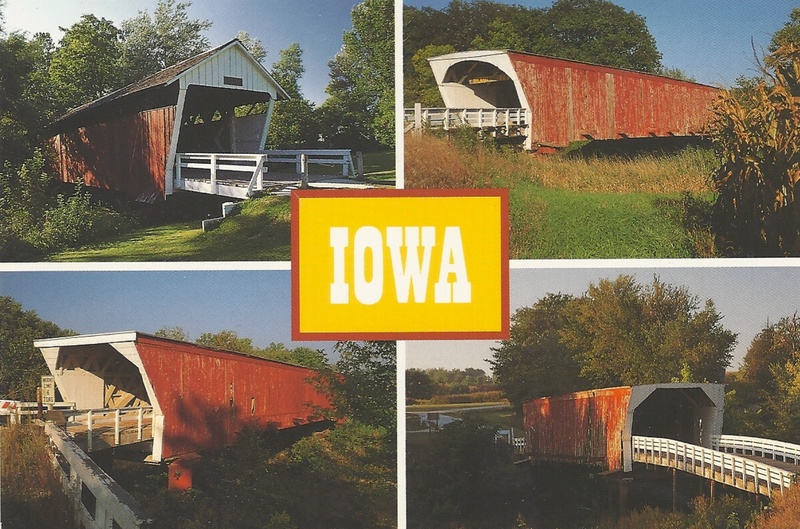 (This bridge was built in 1880 and renovated in 1995, and also sits on its original site. It is the bridge that was actually featured in the movie, apparently). After we (reluctantly) left the Bridge area, we headed back to town to visit John Wayne’s birthplace. On the way down the road, though, all of the sudden, we saw the most amazing thing! Tiny little flickering lights!! My first thought was “FAIRIES” – maybe “TINKERBELL!” But, Peter came up with FIREFLIES!! THIS was the first time in my entire life I had EVER seen FIREFLIES!! I was SO enthralled!!! We had to pull over! I kind of wished we had’ve made it, BUT! if I was going to do it over, I’d still pull over and enjoy the fireflies, instead. I was so awestruck by fireflies, I forgot about The Bridges until I got my film developed. But THEN!!! 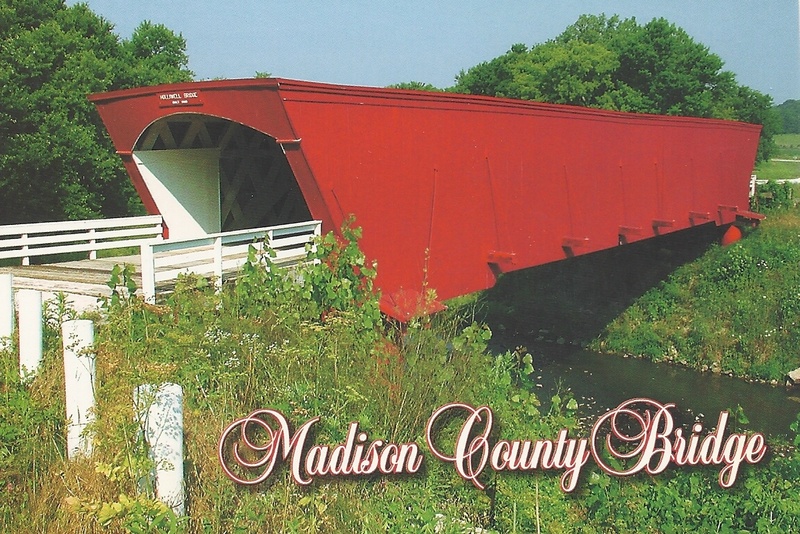 I saw the pictures and was forever hooked on seeing and visiting Covered Bridges! And so, Peter made me a little Covered Bridge for our mailbox, and I painted the lane. As mentioned, I didn’t see the movie BUT I did read the book, once I got home. And, as far as tragic love stories…sigh…I’m glad we went. Wednesday, maybe we’ll be in Chicago..? Love this!!!! 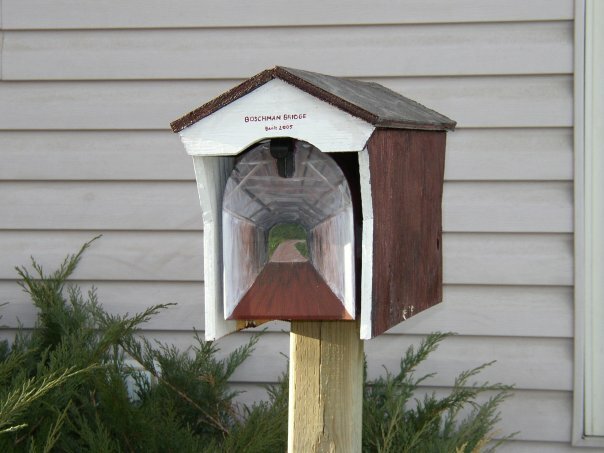 And love the mailbox.